Work Problems are word problems that involve different people doing work together but at different rates. If the people were working at the same rate then we would use the Inversely Proportional Method instead. 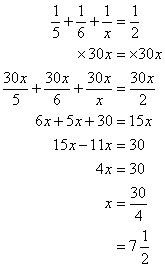 This formula can be extended for more than two persons. It can also be used in problems that involve pipes filling up a tank. Jane, Paul and Peter can finish painting the fence in 2 hours. If Jane does the job alone she can finish it in 5 hours. If Paul does the job alone he can finish it in 6 hours. How long will it take for Peter to finish the job alone? Answer: The time taken for Peter to paint the fence alone is hours. How to solve Work Word Problems? Jim can dig a hole by himself in 12 hours. John can do it in 8 hours. Jack can do it in 6. How long will it take them if they all work together? How to solve Work Word Problems with three persons? If Amy, Bianca and Carrie work together on a job, it will take one and one-third hours. If only Amy and Bianca work, it would take one and five-sevenths hours, but if Bianca and Carrie work, it would take two and two-fifths hours, how long would it take each girl working alone to complete the job? How to solve Math Problems involving rates of work? Gary can paint a garage in 8 hours. Gary van do it in 6 hours. Fred can do it in 4 hours. How long will it take if they all paint together?